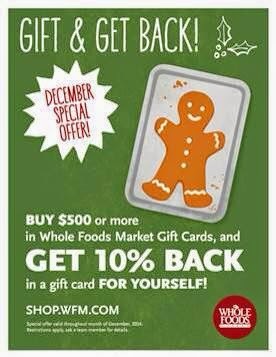 Purchase $500 or more in Whole Foods Market Gift Cards and get 10% back in a gift card for yourself. When I first saw this last year I thought for sure there was a catch. Like, for example, the additional 10% bonus gift card wasn't good until the next day. Or the 10% gift card expired in a few weeks (the way so many bonus restaurant gift cards this time of year do). But there was no catch. I walked up to the customer service desk, bought a $500 gift card and I received $550 worth of gift cards. In its simplest sense this is an opportunity to prepay your grocery bill for as long as you're comfortable floating it at roughly 10% off. I say roughly because a true 10% off would be paying $450 for $500 worth of gift cards rather than paying $500 for $550 worth of gift cards. But as soon as I bought the gift cards I looked around the store and noticed that most everyone had at least $200 worth of stuff in their shopping carts. I wondered why everyone wasn't taking advantage of this offer. Why wouldn't they just buy a $500 gift card use it right away to pay for their purchase that day and use the remainder on their next visit? I still don't know. I think most people just don't think about gift cards that way. First, I'm mentioning this here on this wine blog because Whole Foods sells wine. And wine is sold at rather tight margins. What I like about this promotion is that it gives you a way to get 10% off the best deals you can get on wine at Whole Foods. By that I mean that it enables you to get 10% off on "net" items that otherwise aren't eligible for mixed case discounts. And it enables you to get 10% off on top of mixed case discounts. That's stacking and you know I love stacking. Speaking of stacking, grocery stores are a commonly bonused credit card category. For example, AmEx has Blue Cash credit cards that pay 5% or 6% back on grocery purchases. So this is generally one advantage of buying wine at retailers that code as grocery stores. But wait - it gets better! Through February 15th, 2015 if you register your AmEx Blue Cash card you get an additional 2% cashback. So a total of 7-8% cashback depending on the particular Blue Cash card you have. So, buy $500 worth of Whole Foods gift cards, get a $50 bonus gift card then do your [wine] shopping right there and spend the remainder next time you shop. It's a great deal. Now, you might say "well, Whole Foods prices are sky high so this really isn't that great of a deal". I wouldn't be so sure about that. When I've price shopped wine at their Dedham, MA location they seem to be price matching Costco and other discount retailers on high profile brands. So their prices are competitive in my experience. Taking this a bit further, even if you can't make use of all the balance of the gift card you could probably resell the gift cards at around break-even prices. Which presents an opportunity to rack up points/miles/cashback on your favorite credit cards that heavily bonus grocery spend. All in all this is a really good deal I'd encourage you to consider. Deal runs the month of December 2014. So far I've confirmed it is available in Massachusetts and in other Whole Foods in the region. Update: The Deal Mommy shares this cool way to get even more off your Whole Foods purchases by buying gift cards online. Be aware that online GC purchases may not code as grocery stores on your credit card. I'd recommend doing some trial purchases on your card(s). But $5 back on $20 is 20% off ($20 for $25 worth of value) and that is huge. Subscribe for future wine deal updates. Question of the Day: Have you seen this offer in your area?